Do you remember when I was on holiday in the summer and I had my little knitting emergency? Well, while my other needles were out of action, this is what I worked on to fill the time. It's a cardigan pattern called Peggy Sue by Linda Wilgus. 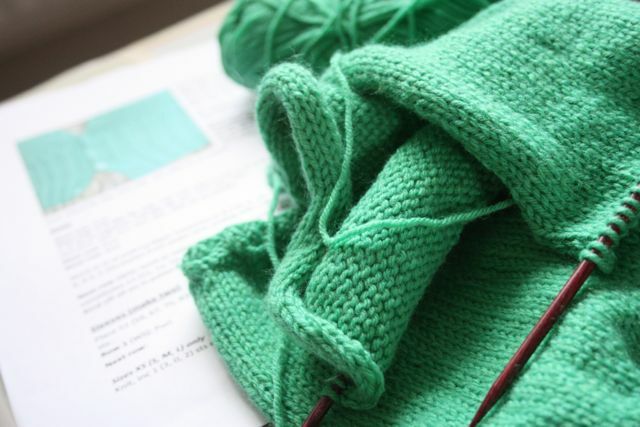 Such a sweet little pattern and I've had it sitting in my queue for a while waiting for the right moment to make it. Since I'm enjoying a real knitting phase at the moment, sparked off by the vanilla knitting experience, it seemed like a good time to take the plunge. It's mostly stocking stitch so it happily filled my 'vanilla' requirements, although it does also have a very pretty cabled rib that luckily I could manage without a cable needle so it didn't tax me too severely. I got some rather cute little buttons for it and at an absolute bargin too, just 10p each. I didn't think you could still find buttons at those kind of prices any more. I love the swirl on them. They are just a little touch too small to be perfect though. I not a great cardigan knitter as a rule, somehow they always seem so daunting, but I think the process is becoming a little easier for me. This is certainly the best fitting garment I've made to date, which is encouraging. Until next time then, when I'll be back with the Dresden Placemat tutorial... exciting! WOW, what a gorgeous cardigan. 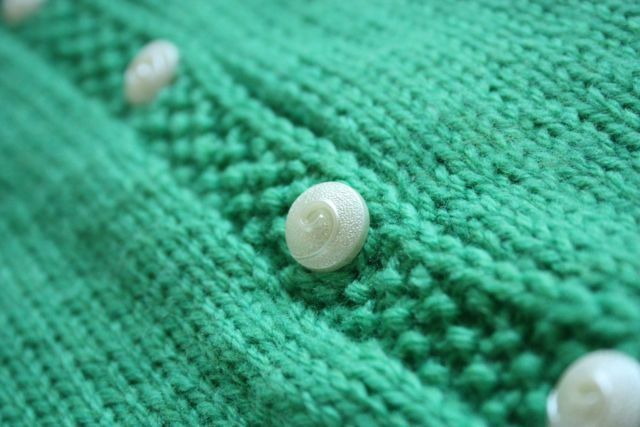 A beautiful pattern and colour, not to mention the cute buttons. Well done! It's lovely! I love that detail at the bottom. I wish I had the patience to knit clothes. I bought a pattern for a tank top and 6 balls of yarn to knit it up. It sat in my craft room for a year until I finally admitted to myself it was never going to happen and got my mum to knit it for me! 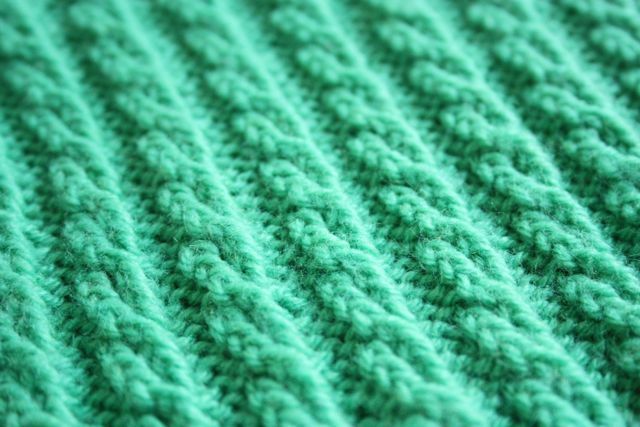 This is beautiful and such a gorgeous colour, sadly I am only able to knit scarves and tea cozies! love the green and I think it fits you well!!! Your cardigan is beautiful!!! I love the little buttons and the little cables!! so pretty!! Love your cardi, it's so pretty. Gorgeous colour too! It turned out nice and looks very pretty on you!! I am so excited for your placemat tutorial!!! 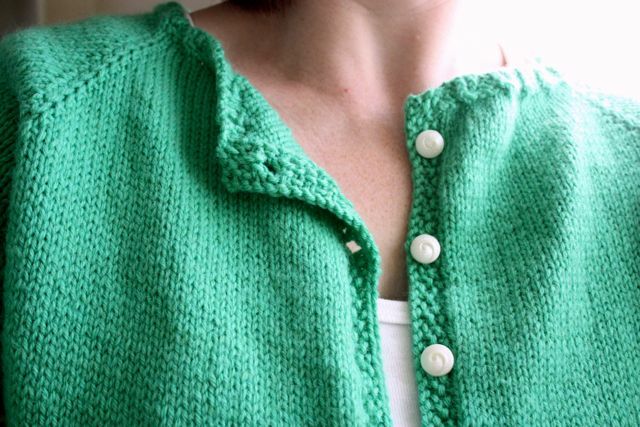 That is a beautiful cardie, I love the cable effect rib on the bottom it's so well done. Love the cardigan! I hadn't knit anything for years but made my first pair of socks this Summer. You've inspired me to try something more ambitious now! Love the color. Love the pattern. and LOVE the cute little buttons. I need to learn this knitty thing. Wow....what a gorgeous cardigan.....such a pretty colour too. The cable detail looks amazing. Love the cardie, well done. As you say a great fit, I really like knits with a waist. This looks great and the color is really bright and spring-y, nice!